I googled 'shishi' real fast and from what I've gathered about them, it would make sense. They're supposed to be symbols of protection, strength, justice, and royalty. They also come in mated pairs and are used to protect sacred buildings such as temples and castles. Of course I'm getting all this from the first source I checked out so I nooooo idea if its right or not ^^;. "Stay back, madam, I shall handle this." "Look, just because I happen to be wearing pink and am somewhat pretty doesn't mean..."
I hate that stupid spear. It takes up the whole page whenever I try to draw him and then I can never fit the picture anywhere. Well, the bigger the weapon, the bigger the ego, I always say. Although, I did wonder for a while, whether Akagane was a "he" or a "she!" Speaking of "mysteries," they get solved when they do; or maybe never. That's the way life is. So, Inu-papa, we shall all sit in front of our monitors, waiting patiently with heads bowed, for the next words of wisdom to fall from your lips (Do spirits have lips? Heeheeheehee.............). P.S. Please do keep the character profiles coming! I find them fascinating! 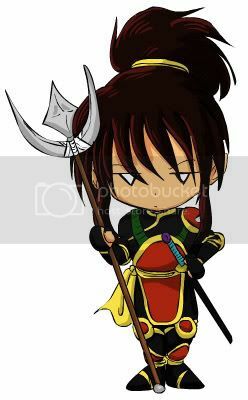 Actually, I think the spear is inexplicably growing, much like Sesshoumaru's fluff. ^_^* In the first image I did of him for his debut in chapter 16, the crescent blades are fairly thin and span maybe a two-foot diameter. Compare that to this image where the blades are fairly thick and probably span at least 3 feet across. With Akagane, however, I've kind of run into an issue that will likely plague me with all the OCs in this story, which is how much time I should spend delving into their side of the story. On the one hand, this story is about me, and I assume people are reading it to read about me, not the OCs, therefore I should keep the focus centered on myself. On the other hand, I'm afraid the OCs aren't going to be at least a tolerable presence if I don't flesh them out as characters in their own rights. The problem is deciding how much to go into their backgrounds without losing focus. I would say to go into an OC's background as much as is needed to justify what they're presently doing. I mean we don't need to know that one time when they were two years old they got food poisoning, unless its some how relevant to the story. I mean you are right in saying that we're reading the story because its about you because...well...why else would any one be on the website let alone reading the section entitled "Memoirs"? Don't answer that...I know that out there, some where in the great void that is The Internet, there is going to be that one person who'll read what you have of the memoir and then wonder why Inuyasha or Sesshoumaru wasn't in it =.=;. I'm just annoyed that the Japanese font I've been using apparently didn't include the characters that make up her name, so I just had to write it in standard MS Mincho. Hahahahaha.............! (rolls around on floor holding belly) "be afwade, be wery awade"
As for "three talon," it would depend. 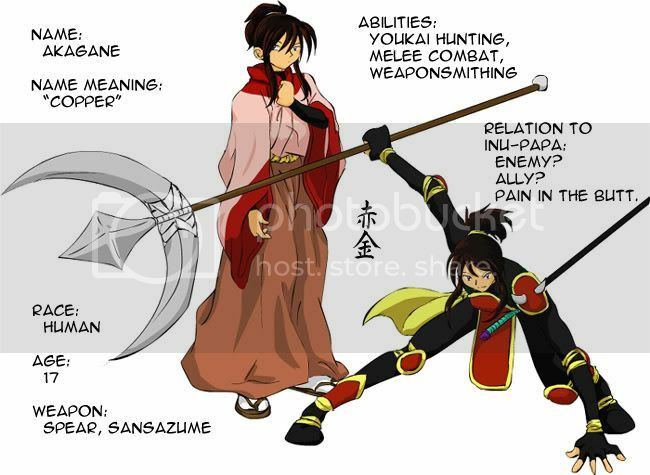 In "InuYasha," they discuss a little bit on how the taijyka's weapons and armor are made of "demon" parts. It was pertanent to the story, 'cause it partially explained why the demons attacked and distroyed the demon slayers village. Sango said that the reason the village was founded there was because the cave of Midoriko. Has it been built yet? Why does Akagane appear to live in this village? Do taijyka even band togther yet? Since this may have something to do with the Shikon no Tama (where is it, by the way? ), it MAY be important. Or not. I find info like that interesting, it rounds out the plot; as long as it doesn't wander to far away from it. Well! 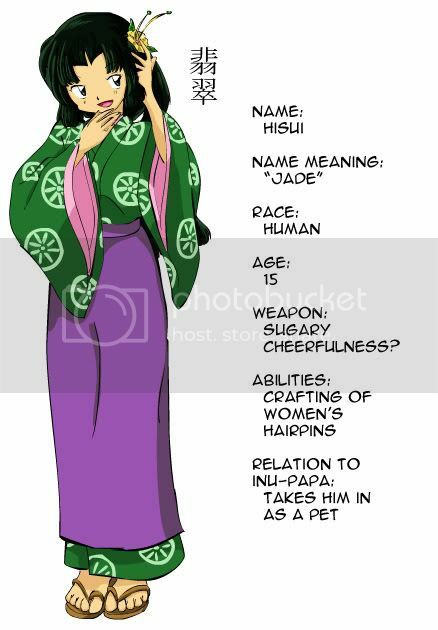 Hisui certainly is one smart cookie! I wouldn't be surprised if she knows more about you than you know yourself! it's also interesting that she does not seem to be affected by the Shikon no Tama. And some of my eleventymillion questions have been answered. Heeheehee! But that just means I have more! What are kannushi? Might these Koma-inu be relatives of yours? And what is going on with Akagane's sister? Kannushi are Shinto priests, the same as miko are Shinto priestesses. I figured if I was going to be using the Japanese term "miko" for the female version, I might as well be consistant and use the Japanese term for the male version, too. The other two questions will be addressed in later chapters, the latter in the next chapter, actually, so I'll refrain from commenting. Oh My, Ugh! SCARY! Of course it's obvious; she's either alive, and possessed; or dead and possessed. Either way, not a happy situation. But! Why did she choose YOU for a midnight "smooch?" ANOTHER MYSTERY! Heeheehee! Hmm, I totally forgot about the "luminous chrysalis," as I called it. Hisui's explanation is as good as any. And considering that Kikyou may not have returned all of Kagome's soul after Urasue revived her, it could be that souls (especially "large souls" like Kagome's) have many parts, some of which can be separated. I was actually a bit worried that this chapter would be a bit too freaky compared to my previous ones. I mean, an 8 year-old (... ish, I haven't really solidified how old I'm supposed to be) being molested by a dead 10 year-old? And that's not even the worst of some of the effed-up stuff that happens later. I'm kind of glad that people are assuming that it's "obvious" that she's posessed because... she's not. ^_^* But I've been really afraid that I'm going to write a hint that's too obvious and people are going to figure out what's actually going on before the "Oh SNAP" moment. Yeah, there have been multiple times in the series where a soul has been in pieces. Another time is when Kanna tried to absorb Kagome's soul with her mirror, but couldn't fit all of it, so Kagome was still left with some. So, I just came up with a "the soul is in pieces" explanation to both fill in that gap in the plot and to serve my own purposes in this story. Ooooo Kay! Ya got me. Another Mystery! Yaaaaaay!